Stop by the hotel's restaurant for lunch or dinner. Dining is also available at the coffee shop/café, and room service (during limited hours) is provided. Quench your thirst with your favorite drink at the bar/lounge. Full breakfasts are served on weekdays from 7:00 AM to 9:00 AM and on weekends from 8:00 AM to 10:00 AM for a fee. With a stay at March Cottage Bed And Breakfast in Faversham, you'll be within a 15-minute drive of Whitstable Beach and Maison Dieu. This 4-star bed & breakfast is 8.9 mi (14.3 km) from Canterbury Cathedral and 8.9 mi (14.4 km) from Marlowe Theatre. Enjoy a satisfying meal at Sun Inn Restaurant serving guests of The Sun Inn. Wrap up your day with a drink at the bar/lounge. A complimentary breakfast is included on weekdays from 7:30 AM to 9:30 AM and on weekends from 8:30 AM to 9:30 AM. Faversham is a historic market town in Kent. With a history dating back to pre-Roman times and a location near the sea and some fabulous countryside, a visit to one of our Faversham hotels will put a smile on the face of even the most discerning holidaymaker. The best way to see this pretty town is to take a stroll through its cobbled streets. Start your journey at the Fleur de Lis Heritage Centre for the perfect introduction to Faversham and its rich past. Here you will find exhibits that will entertain old and young alike, including a scale replica of a Victorian schoolroom and kitchen. There are also displays dealing with Faversham's historic explosives industry. Visit the centre's excellent bookshop for a tome on the local area, with which to continue your studies. After a journey in to the past, visit the refreshing present with a tour of the Shepherd Neame Brewery. Britain's oldest brewer has called the town home since the 16th century when it first began brewing its fine Kentish ales. The tour is fascinating and very popular, so make sure you book your place early. For another dose of old Faversham, stop by the Maison Dieu, on Ospringe Street. This 13th-century building once housed a small monastery and provided accommodation for pilgrims visiting Canterbury from the Continent. Today it houses a wonderful village museum, where you can find everything from Roman artifacts to medieval weapons on display. Faversham isn't called a market town for nothing and the Faversham Markets have been frenzied places of activity for over 1,000 years. The main market, mentioned in the Domesday Book, is situated in the heart of town, next to the Guildhall. This runs on Tuesdays, Fridays and Saturdays every week and sells all manner of things, including fresh local produce and unusual bric-a-brac. There are also two specialist monthly markets that take place in the town, so shopaholics really are in for a treat. On the first Saturday of every month, in Preston Street, is the Best of Faversham Arts, Craft and Food Market. While the antiquarians among you will be glad to hear that the first Sunday of every month sees the Faversham Antiques and Vintage Market come to town. 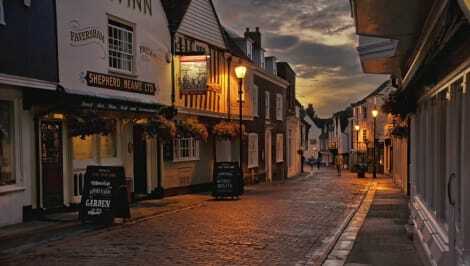 After a long day of shopping and sightseeing, rest a while in one of Faversham's many pubs and restaurants. Fans of spice will go wild for the Albion Taverna, one of the best Mexican restaurants in the country, situated by Faversham's lovely waterfront. Savor some of the restaurant's delicious homemade cuisine while surveying the beautiful surroundings. If you're after something a bit more traditional, Ossie's Fish Bar on Preston Street is open all day and serves the finest fish and chips in all of Kent. The Elephant pub on The Mall regularly tops polls of the best real ale pubs in Kent. With a cosy log fire, live music on weekends and a splendid garden, this pub really is the ideal place to spend your evening.